When it comes to keeping CH kitties safe in the home, there are a number of best practices. That said, every so often, one of us comes up with a fabulous new idea. Such is the case with CH cat mom Dianne Brittain. A few weeks ago, Dianne posted a few photos to the CH Cats & Kittens Facebook group that received rave reviews. The idea was simple and genius. 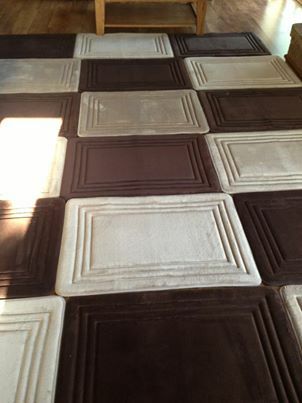 She created an innovative living room carpet specifically for her CH kitties. The “carpet” was actually created by sewing memory foam bath mats together in rows. This can be a great idea for CH kitties for several reasons. First, most of our CH cats do best while walking on some sort of textured flooring covering, like carpet. Second, since CH cats are by nature unsteady, these memory foam mats provide a safe and cushy spot to land, fall, or crash. Dianne used a total of 18 bath mats for her carpet, but this number can obviously be tailored to your space and needs. She said each one of her mats is about 2 feet by 3 feet in size. To hold them together, Dianne said that she hand-stitched the ends. I love this idea since she can always take them apart to come up with a new pattern or to replace a mat. Since they’re bath mats, they have a grip on the back that prevents them from sliding around on the floor. Dianne said that these mats can be thrown in the washing machine (how convenient! ); two of her rows can fit in her washing machine at one time. While Dianne purchased her mats at Costco, I’ve done a little hunting and it looks like similar bath mats can be purchased at a variety of stores including Bed, Bath and Beyond, Amazon.com, and Target. It can be a bit of an investment, but for some, it could definitely be worth it. In addition to being a living room floor covering, I could also see these coming in handy around your bed, at the base of a cat tree, and more. If you can’t afford to cover your whole floor with them, perhaps you can create runners for your hallway and in front of your couch. Have you done something like this for your CH kitties, or do you plan to? Please share your thoughts in the comments! Looks great but will it hold up after repeat washings? Bath mats with “rubber” type backings (memory foam is in that category) usually crumble after repeat washings and drying which can be dangerous . Do her cats use a pan? It would be interesting to know. These mats are pretty tough, but if the backing begins to crumble, they can easily be cleaned by simply hosing, either with the outdoor house or a laundry tap-hose. Then lie them outside in the sun to dry or hang over an airer (or even the side of the bath!) if the weather isn’t so great. This means they are subject to less of the twisting and tumbling than in the washing machine and drier and might help the backing last a little longer. One of our CH cats is a burrower, so we got a few old wool blankets, folded them up so he can crawl in, and put them in his favorite places. One night, after he’d fallen down the cat steps leading to the bed, my wife moved one of his “burritos” to the foot of the steps as a landing pad. Anchoring it securely also helped him get a firm stance when reaching for the first step, and he hasn’t fallen from the steps in at least a year. We also got a set of foam-rubber interlocking floor mats (like for a child’s play area) and laid them down our hallway to help a new foster kitten practice walking safely. That little guy has CH and is blind, so he falls and gets disoriented a lot.